All the RBI Solar racking systems are designed by a team of qualified engineers and designers to real site conditions and fabricated in state-of-the-art manufacturing facilities. Ohio-based solar racking manufacturer, RBI Solar, Inc., is exhibiting at Intersolar 2013. Three days of innovation, education, networking and exhibits start July 9, and run through July 11, 2013, at the Moscone Center, San Francisco, CA. RBI’s engineers, technical specialists, and executives will be on hand to answer your questions about solar mounting systems. All the RBI Solar mounting systems are designed by a team of qualified engineers and designers to real site conditions and fabricated in a state-of-the-art facility. Along with providing a perfect solar mounting system, RBI also offers solar racking installation at a very competitive cost. RBI’s skilled crew is equipped with high-tech post driving machines and certified operators. In 2012 the conference featured 30 sessions with 220 speakers and catered to about 1,500 conference attendees. The PV ENERGY WORLD stage will offer educational presentations on the topics of energy storage, balance of systems, and PV production technology. 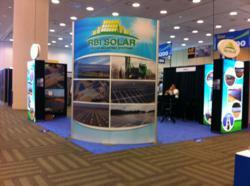 The conference includes Solar Summerfest, hosted by CALSEIA and Intersolar, on July 9th. This year's Summerfest theme is "Welcome to the Golden State." We will be celebrating all that California is known for – surf, sun, Hollywood, San Francisco, and wine country. RBI Solar, Inc. is the leading turn-key supplier of solar mounting systems. As a specialist in ground mount solar, roof mount, landfill solar racking and custom designed specialty solar structures, RBI Solar focuses on providing the most robust solar racking systems, installation services and project management capabilities to serve owners and integrators. RBI Solar has engineers on staff licensed in all 50 states and offers complete design, high tech manufacturing, nationwide installation, and technical support to help solve the toughest challenges in the industry. Leveraging more than 80 years of experience in the commercial design-build specialty structures market, RBI Solar works with its clients to identify the most economical, durable and robust solution for solar installations. With events spanning four continents, Intersolar is the world’s leading exhibition for the solar industry and its partners. Intersolar’s objective is to increase the share of solar power in the energy supply. By providing first-rate services, Intersolar exhibitions and international conferences bring businesses, technologies and people from the most important markets around the globe together. The Intersolar team has more than 20 years of experiences in opening up markets, providing specialist knowledge, and creating links: Connecting Solar Business!